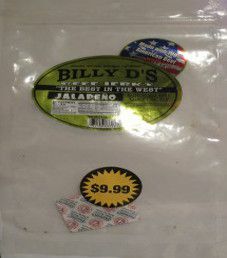 I bought this jalapeno flavored bag of Billy D’s beef jerky at a convenience store in San Diego, California, back in 2011. This bag was a whopping 10 ounce/283.5 gram size. In my visits to California, for whatever reason, it was more common to see these 10 ounce bags of Billy D’s beef jerky for sale, opposed to the more normal 3-4 ounce bags.